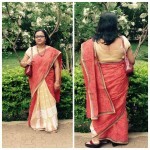 Cotton saree was our school uniform from grade 9-12. We ourselves used to wash, starch and iron them every week end. The blouse was very unique, like half-shirt.